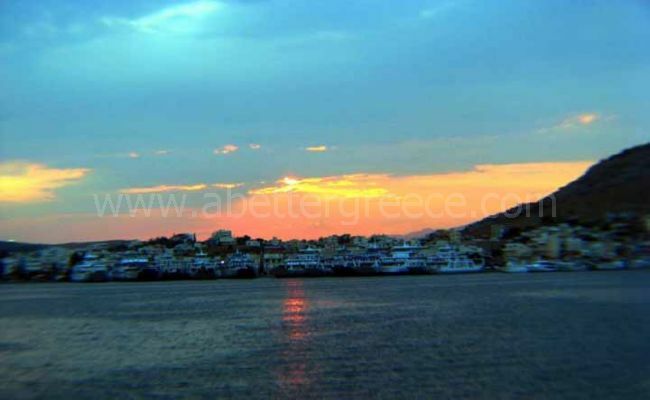 Salamis or otherwise known as Salamina is a beautiful, non-touristy and tranquil island located very close to Athens. According to myths and legends Salamis was named after the Nymph Salamina, the daughter of the Corinthian river Asopou and Koulouri from the ancient cape (Kolouris Akra) where the ancient city was built in 4th century. According to myth, Poseidon fell in love with Salamina and she gave birth to Cychreus the first king of Salamis who was half man half fish. The next king of Salamis was Telamon who married the daughter of Cychreus, Glauce. After her death he married Erivia or Periboea and the legendary AIAS (AJAX) was born, who was the leader of the Salaminian and Megarian army at the Trojan war. Whenever one thinks of the island of Salamis, his or her thoughts go back 2,500 years ago. Then when the famous naval battle between the Greeks and the Persians took place between its straits. The Greeks won and the enemy from Asia withdrew completely. Historians have wondered as to what the fate of Western civilization would have been if the Greeks had lost this battle. Today there are almost no traces on the island to testify to what happened here in 480 BC. There are simply the same straits in which the naval battle took place, the beautiful island, the magnificent Argosaronic, the pine-covered mountains, the pretty gulfs and their coves. Only now that the majority of these coves and gulfs have been filled with densely- populated summer resorts. I say most of them, because there are still secluded beaches and isolated fish taverns on the southern coast. Of course, the island’s capital, old koulouri, could not have remained an exception to this growth, and has developed and evolved into a modern town with its port and its large fishing fleet. The other resorts have also grown. There is now a good road network and bus routes which connect all the resorts. The road network extents to the more sparsely populated areas, giving the visitor the opportunity to enjoy the beautiful forests and indented coastlines of the island, and even to visit its two most important monasteries: Faneromeni and Ayios Nikolaos (Saint Nikolas). You can reach the island of Salamis also from Perama, which is opposite Piraeus, and the journey by ferry boat takes only ten minutes, you will arrive at Paloukia on Salamis island. A visit to this island can make a beautiful day trip, an overnight stop or even a much longer stay at one of the island’s beautiful beaches. A stay with many surprises and experiences in store, as well as an unforgettable memory. Nea Perama – Faneromeni (every 30 minutes, by ferry boat; duration app. 5 min). Municipality of Salamina Folk Art and History Museum: It host exhibits of the island’s history, including a collection of local costumes, furniture, agricultural tools, weapons and ceramic items. Maritime museum: An outdoor museum in the area of Paloúkia exhibiting cannons and torpedoes. Ancient port: The ancient port is located in the area of Ambelákia and dates back to the 4th century BC. The port contributed significantly to the economic development of the ancient city of Salamis. The famous naval battle of Salamis also took place here. Ambelakia is the oldest village on the island, 4 km south of Salamina, and it certainly worth a visiting! Churches and Monasteries like Faneromeni Monastery, Ayios Nikolaos Kalyvitis and Ayios Dimitrios Church. In the southern side of island beautiful beaches and creeks are existed as: NATO beach in Aianteio, Kanakia, Pyrgiakoni, Lamprano, Saterli, Kolones, Pigeons, Aias – Club, Kyriza, Lymniona, Giala and the Selenia. Also beautiful beaches you will see in the north-western side, as: Psilli Sand, Steno Faneromenis, Resti, Iliakti, St. Giorgi and in Vasilika. Also two organized Municipal Beaches are existed Beach ”Zefyros” which is found in Aianteio and beach ”Spithari” that is found in Resti. The access in all these beaches is easy, with private car, with buses of KTEL Salamina or even with sea boats. The town of Salamis, or Koulouri, as the people of the island’s capital call it, is only 21/2 kilometers from Paloukia, there were the ferryboats moor. 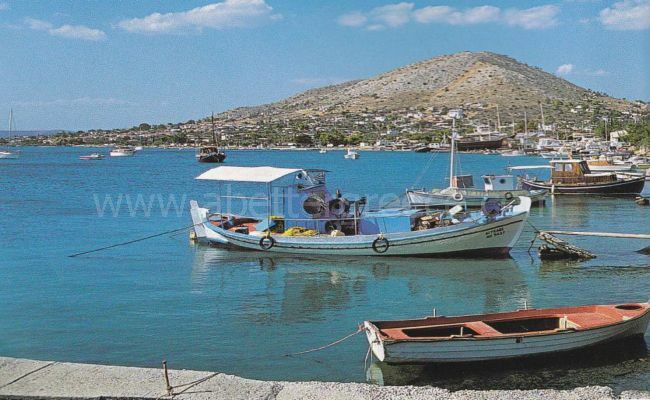 The travelers who come from Perama in Attica need only ten minutes to reach the island. Most of those who travel with their cars do not even get out of them, and as soon as they reach Paloukia follow the coastal road to the left. The road to the right leads to the naval dockyards. It all happens so quickly that one does not have enough time to enjoy the surroundings. 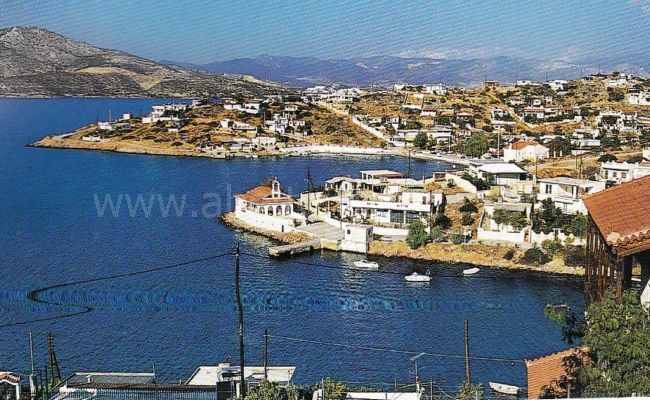 All that one remembers is the settlement of Kamatero with the large white church on the hill to the left of the gulf and the little islet of Ayios Georgios to the right, the old quarantine with the abandoned houses, the rocky hill above Palouki and the swarm of ferryboats moored at the port, lined up next to each other, waiting their turn to travel on their regular but brief journeys. The visitors follow, then, the coastal road to the left. Those who are travelling to Koulouri should pass by the first crossing to the left, the one which goes to Ambelakia and Selinia as well as the next crossing which goes towards Moulki. They will then soon come to the coastal road for Koulouri. This wide coastal avenue, with the new houses to the right, gives the image of a new town, one which has little in connection with old Koulouri, with its pretty, old houses and their gardens and flowers. The fish market on the left at the beginning of the town, with the swarm of fishing boats in front of it, their nets spread out, reminds you that you are on an island with a naval tradition and that many of its inhabitants worked in the merchant navy or are employed in fishing. After the fish market, a large square in front of the sea has an elegant marble war memorial at its center. A little further down is a marble bust of Georgios Karaiskakis, one of the leaders of the 1821 War of Independence, whose name is closely connected with the island. Both are set on a raised marble stand. Some tall palm trees opposite the war memorial, in front of the town houses, give a touch of grandeur to the area. Behind the town rises the precipitous and rocky hill of Profitis llias with a church of the same name perched at its peak. This very tall hill is visible from all around. The coastal road continues and splits for a while at the splendid church of Ayios Nikolaos. The Archaeological Museum has been stationed temporarily next to it. The seaside taverns and cafes begin a little further down. The port is more picturesque here. These taverns and cafes are raised and provide a wonderful view over the sea, which is filled with little boats and caciques. The coast with the rocks or the flower beds give a different picture from the one we have seen up until now. The high point is the keels around the edge of the port. Fanermomeni Avenue begins opposite the fish market. It goes uphill at first, and crosses through the town. There are two interesting churches with old wall paintings at the upward slope to the left, not far from the beginning of the Avenue. 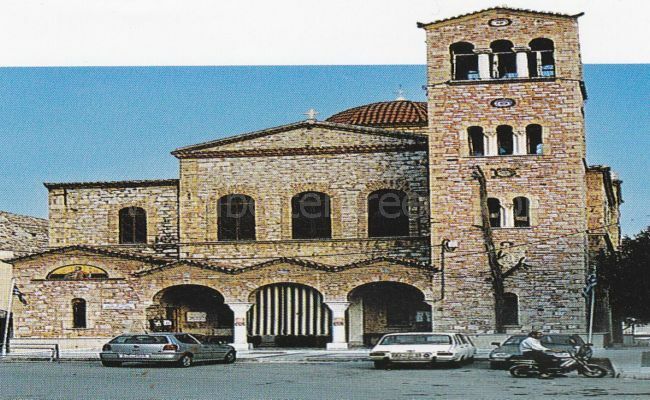 The first is the Panayia Bosko, on a little lane next to the Avenue and a little above the large church of Ayios Minas, with the white and brown stone, its tall belfry and fine wall-paintings. The local ‘Euripides’ Conservation and Cultural Centre have offered much to Salamis through its activities. The Library, with its rich holdings, and the Folk museum, in which there are exhibits of local traditional dress, paintings, and objects from the war of 1821, are examples of its work. An open-air theatre has been built on the hill above the town. Various events take place here, such as the Panhellenic Poetry Contest in memory of the great poet Angelos Sikelianos. The view from the theatre of the town’s restored windmills and the closed gulf which surrounds it is wonderful. Monastery of the Faneromeni North Coasts Faneromeni Avenue reaches as far as the western edge of Salamis town and continues until the crossing with Ayios Georgios (St George). The road to the right leads to the north coast, where there is a crossing. Those going to the Monastery of the Faneromeni should take the road to the left. The road to the right leads to Psili Ammos. The whole of this route goes through a pine forest reaching as far as the sea. The Monastery finally appears after you have traveled a total of six kilometers. It looks long. Its tall and white walls have a row of windows on the first floor, yet there are no windows on the ground floor. 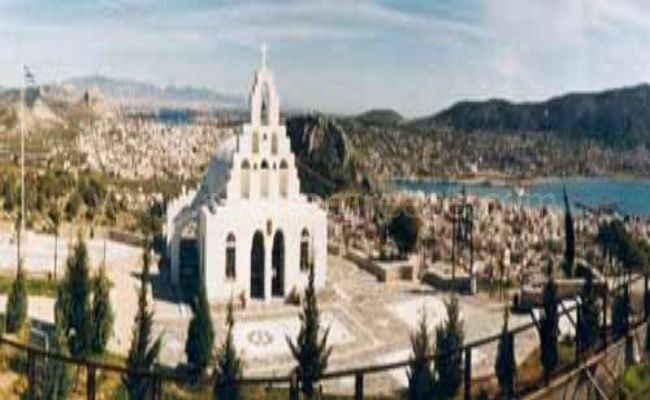 It has red tiled roofs from which the domes of the cathedral church rise. 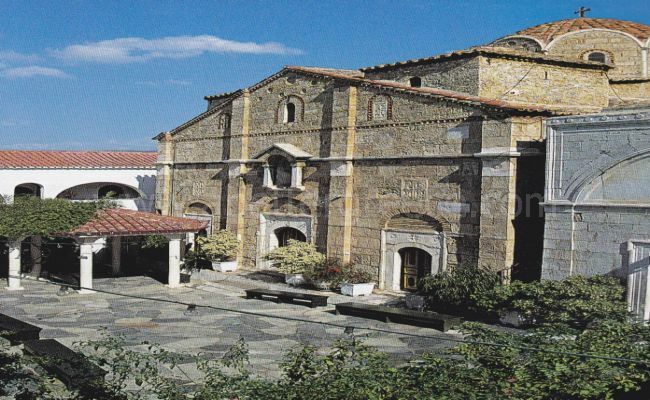 This old monastery was most likely founded in the 13th century, and was refounded much later by the Megarian Lambros Kanellos who, as the tradition goes, saw in his sleep the Panayia inviting him to go to the monastery. Kanellos obeyed the Panayia’s invitation went to the island and found her miracle-working icon, which revealed (‘fanerothike’) itself in front of him. This is why the icon was called the Faneromeni, as was the new monastery which was built again from scratch. Nothing remains of the original monastery, aside from its beautiful cathedral church, a five domed basilica with many beautiful wall-paintings dating from 1735, among which stands out the representation of the Last Judgement. The Monastery played an important role during the 1821 War of Independence, and successfully withstood many Turkish attacks. During the Second World War it came under threat of disappearance, and so became a nunnery. It was thus saved and able to flourish, so much so that it founded a retirement home for women. Its vestry holds priceless relics. The great poet Angelos Sikelianos lived for many years in a two-story house belonging to the Monastery, which stands half-ruined at a little distance from it. A bust of the poet stands a few meters away. The road from the Monastery continues in a westerly direction to Perama. 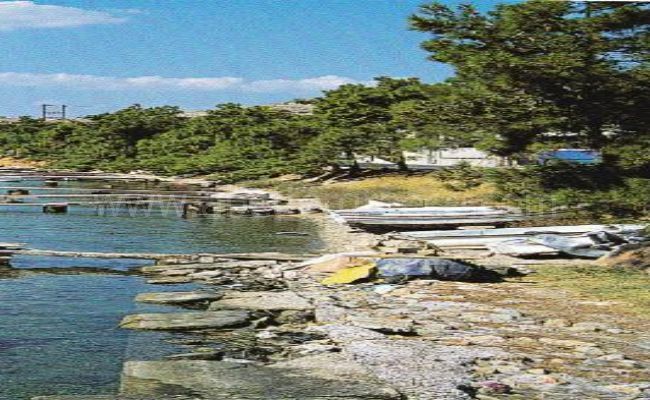 Perama serves as the island’s second entry point, this time for travelers coming from the region of Megara. Ferry boat connections from here, however, are less frequent than those from Paloukia. As mentioned above, the road to the east of the Monastery of the Fanermomeni, at the crossing a little before it, leads to the right to Psili Ammos. Here we shall find the little Byzantine church of Ayios Georgios, which resembles that of Ayios loannis (St John) Kalyvitis near the Monastery of Ayios Nikolaos Lemonion, which we shall see below. The road continues to Vasilika and the exceptionally charming Ble Limanaki (Little Blue Port), which is built around both sides of the small bay. It terminates at the luscious-green village of Batsi, the houses of which clamber up the slope of the hill, which cuts sharply into the sea. The first village that the traveler will see on the island as he or she approaches on the boat from Paloukia is Kamatero. Built on a low hill to the left, the brilliant-white church of the Panayia rises grandly high on the peak. Behind the church stretches the archaeological site of the ancient city of Koulouri. Among the remains are the ruins of a tower from the city wall (4th century BC), protected by cordoning and roofing. At another point are the ruins of the Temple. Ambelakia, 3 km. from Kamatero, has evolved into a modern small provincial town, with more new houses than old. Clean and looked-after, they are built on the site of the ancient city of Koulouri. Indicative of this is the cordoned-off archaeological area in the square of the Tragic Poets in the center of the town, near to the central square with the war memorial. The port of the ancient city was located in the bay of Ambelakia. From there, a long and narrow peninsula, Kynosoura (oura kynos = dog tail) continues to the east and offers a wonderful view towards Perama on the coast of Attica opposite. Between Kynosoura and Perama is a section of the historical strait in which the celebrated Battle of Salamis between the Greek and Persian fleets took place in 480 BC. The hill of Aigaleo can be seen above Perama. The Greeks were indeed fighting for everything at Salamis. For their homeland, their temples and, although they may not have realized it, for all of Europe. Themistokles had the victory trophy set up at Kynosoura, although not a trace of it has survived today. To the south of Ambelakia is Selinia (6 km. ), a delightful coastal resort with well-tended roads, a small pier for the boats which come direct from Piraeus, especially in the summer, and the wonderful church of Ayios Nikolaos with its blue dome in front of the pier. A new asphalt-surfaced road leads from Selinia to Kaki Vigla. 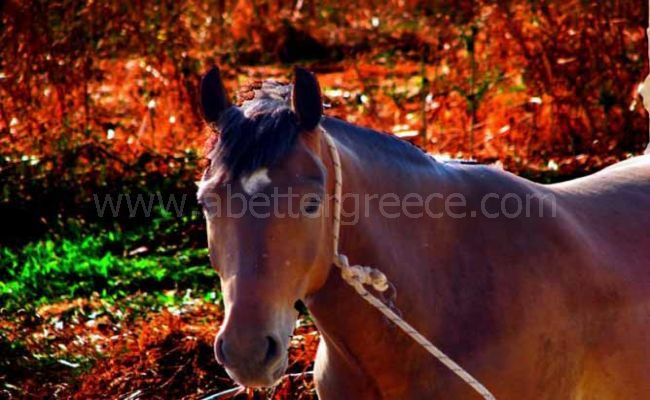 There are two routes which one can follow to go from Koulouri to Kaki Vigla. One passes through Selinia and is the continuation of the previous route, and the other, which we shall see further below, passes through Moulki. Both these two routes are approximately 11 km. long. Kaki Vigla is an old inland village in the south of Salamis, and is now a transport node. Its coastal settlement is at a distance of only 1.5 km. and is located at the cove of a gulf which is encircled by a rocky mountain to the left and a pine covered mountain to the right. In the middle of the gulf there is a beautiful sandy beach, which alternates with a pebbly one, whilst the settlement also spreads out along the slope of the mountain to the left. From Kaki Vigla and beyond, all the south coast of the island is full of small, pretty bays in which resorts have developed. They are easy to visit as they are almost all connected by an asphalt-surfaced road. Some can even be reached by bus. Following, then, this asphalt-serviced road, and by-passing Yiala, which can be reached by the dirt road to the left, one can visit Kyriza and neighboring Perani. From here, one can stop for a little while further up to enjoy the view from high above the Ajax Club. This is a name which has stuck from the days when there was nothing here except for the full (at the time) camp site known as the Ajax Club. Now, villas have been built all around the bay, with gardens which look on high over the sea. Even the rocky little peninsula, which protects the gulf from the wind and the waves, has been built upon. Yet, even now that it is full of houses, the bay is still enchanting. After the Ajax Club the road passes the village of Halioti, after a while reaching Peristeria, with the islet of the same name opposite. This area, however strange it might seem, has not changed at all, and no new houses have been added here. There are still two fish taverns here, just as in the old days, and of course the church of Ayios Nikolas next to the sea, with several little boats and small fishing caciques’ moored on the rocks in front of the sea. Above Peristijia is the cave of Euripides. In this cave, which has ten chambers, objects dating to all periods of antiquity have been found. From the Neolithic to the Mycenaean, to the classical and Roman, and to the period of Frankish rule. A skyphos (cup) with the name of Euripides has also been found. This, along with other evidence, has contributed to the belief that this is the cave where the great Greek tragedian withdrew to write his tragedies. After Peristeria, the Faros (lighthouse) rises above the cape, which is the most southerly point of the island, and a little further along is the village of Kolones, nestling in the cove of a sandy bay. On a raised area next to the village are cordoned off the remains of the prehistoric capital of the island, which was called either Salamis or Kychreia. This city was abandoned, whilst the other capital of Koulouri at Ambelakia was to flourish later. The area took its name Kolones (columns) from the ruins. The coastal road terminates a little to the north, at Saterli. Greek Mythology tells us that the island took its name from the nymph Salamis, daughter of the river god Asopos. Zeus fell in love with Salamis and brought her to the island. Here she gave birth to their child Kycheras, who became the island’s first king. Telamon,son of the legendary king of Aegina Aiakos, had fled to the island of Salamis after the murder of his brother Fokos. Kycheras had no sons, but he gave his daughter Glauke in marriage to Telamon, also handing over his throne to him. Glauke died without leaving any children behind her and Telamon then married Eriboea, with whom he had Ajax (Aias), the patron hero of Salamis. Ajax was leader of the Salaminians and the Megarians during the Trojan War. It was he who took the body of the dead Achilles to the Greek camp, risking his own life. 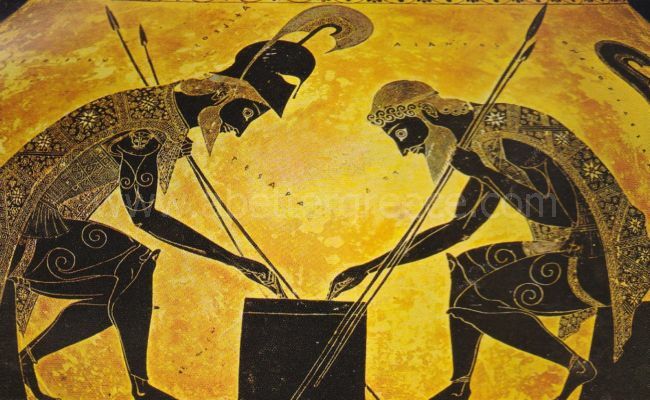 It had been said at the time that Achilles’ armour would be given to the person who had contributed the most to the war effort, and it was eventually given to Odysseus. Ajax considered this to be a great injustice and he became so downhearted that he killed himself. His heroism inspired the greatest tragic poets; indeed, one of Sophocles’ seven surviving plays is named after him. 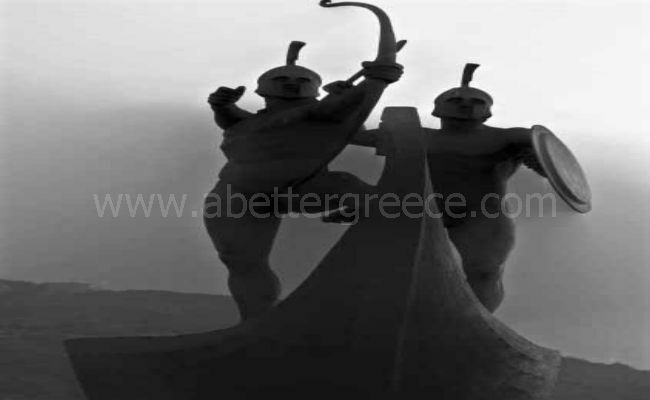 We also know that the ancient Greeks honoured Ajax with the Ajaxian Games. For archaeologists the discovery of the remains of his palace is a challenge equal to that of finding the remains of Odysseus’ palace on Ithaki. The first inhabitants of Salamis arrived in the Neolithic period. This can be seen from the finds in the south of the island. There are also finds from the Mycenaean period, during which the island flourished. 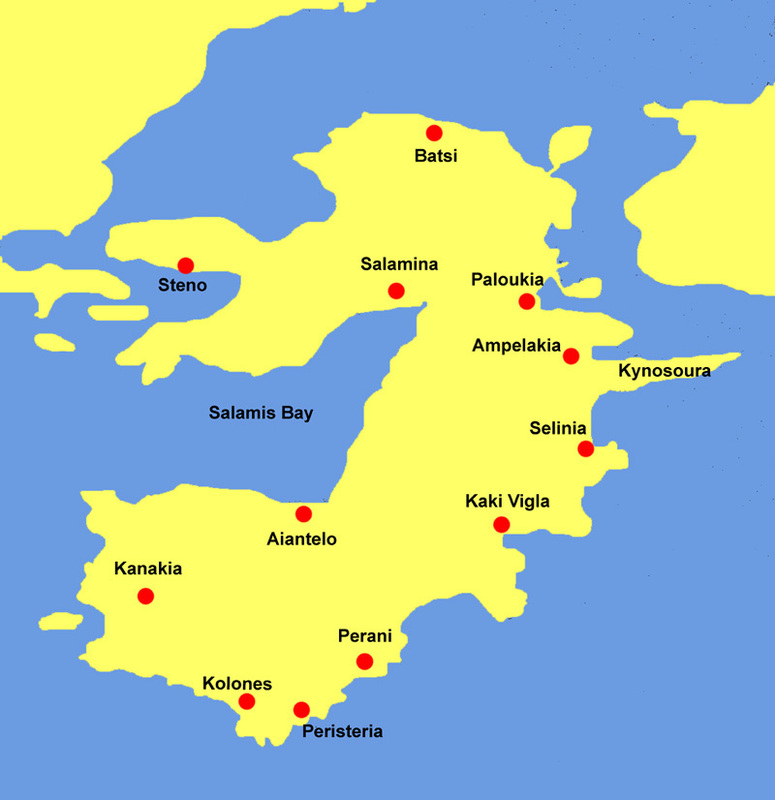 The prehistoric city was built at Kolones, on the island’s southern coast, and was moved in the historic period to the site between today’s Kamatero and Ambelakia. This was the ancient city known as Kolouri, a name which, with a slight variation to Koulouri, the inhabitants still use for their capital as well as the whole of the island, although the official name for both is Salamis. Its strategic position made Salamis an object of contention between the Athenians and the neighbouring Megarians, a struggle which the Athenians, led by Solon, eventually won. The greatest naval battle of antiquity took place in the island’s strait in 480 BC. The Persians had defeated Leonidas and his 300 men at Thermopyles and had gone down to Attica in order to bring the war to a final close and make themselves rulers of Greece. The only obstacle in their path was the mighty fleet of the Athenians and their allies, which had to be defeated. The Persian king Xerxes had taken steps to guarantee that this was achieved. He had come himself as the head of, it is said, 1,200 ships which bore 300,000 men. The Athenians could only marshal up less than 400 ships, which were smaller than those of the Persians, and a crew of 85,000 men. The Athenian general was Themistokles, who had always believed in a leading role for the fleet in the defence of Athens. Themistokles, in a clever ploy, managed to trick the large Persian fleet into engaging in a clash not on the open sea but in the straits of Salamis, where what mattered most was not the size and number of the enemy ships but the agility and speed of the Greek ships and the great knowledge that the Greeks had of the straits. The subsequent history of Saiamis does not differ much from that of the other Argosaronic islands. The island was a refuge for civilians and fighters during the 1821 War of Independence against the Turks. Georgios Karaiskakis, the great hero of the War of Independence, had his headquarters on the island and was also buried here, in accordance with his wishes. The visitor to the densely-populated island of Salamis today will find it difficult to believe how much the place has changed in just a few decades. The old people talk of what was once a quiet island with indented coastlines and a few fishing harbours. About the capital Koulouri, with its old houses and flower-filled gardens. The island was indeed like this, but a century ago not a few decades ago. Now, everything has changed. The indented coastlines have become filled with summer resorts and Koulouri has become a modern town. What has not changed is the love of the Salaminians for the sea, something which has its roots in the mists of time, when the island sent its ships to the Trojan War and when the historic naval battle took place in its straits. The centuries have passed since then. Bounded on all sides by Athens, Megara and Aegina, the powerful cities of the time, Salamis did not have many opportunities to develop and it was only in the 19th century that, thanks to the industriousness, bravery and persistence of the Salaminians, the island created a worthy fleet of its own. So much so, that shipping and commerce flourished in the 20th century. Today the island has one of the largest fishing fleets of Greece, with trawlers and other fishing boats, and fishing along with the naval professions and farming are the island’s main occupations. The older people even remember the local customs, which, with the passing of the years, have either faded away or disappeared completely. The customs relating to the wedding, the supreme social event, are revived every now and then. They do not include the engagement, which was often arranged when the partners were still children, nor match-making. But the basic points of the ritual are still observed. The display of the bride’s dowry, the ‘making of the bed’ during which all the friends place their gifts on the bridal bed, and, of course, the evening meal after the wedding. In the old days the bride would wear the traditional bridal gown at the wedding, which was far more luxurious than all the other types of dress. The traditional dress of Salamis became the prototype for all the Argosaronic islands. This dress included: the white lace shirt, the ‘zipouni’ (a waist-length jacket) with gold-embroidered sleeves, the dark red apron with gold embroidery, the impressive skirt, gold-inlaid shoes, a gold necklace and a head scarf. The local customs may have faded on the island, but this is not the case with the festivals organised when the churches celebrate their feast days, such as that on 15 August, the feast day of the Panayia, at the Monastery of the Faneromeni, which is the largest on the island. The name Faneromeni means ‘revealed,’ as it was here that an icon of the Panayia, the Virgin Mary, was found. Most people travelling to Salamina rent their vehicles on the main land, but there are a couple of rental agencies on the island of Salamina that we will give to you soon! Salamis is a beautiful, non-touristy and tranquil island very close to Athens. According to myths and legends Salamis is named after the Nymph Salamina the daughter of the Corinthian river Asopou and Koulouri from the ancient cape (Kolouris Akra) where the ancient city was built in 4thcentury. According to myth , Poseidon fell in love with Salamina and she gave birth to Cychreus the first king of Salamis who was half man half fish. The next king of Salamis was Telamon who married the daughter of Cychreus, Glauce. After her death he married Erivia or Periboea and the legendary AIAS (AJAX) was born, who was the leader of the Salaminian and Megarian army at the Trojan war. Salamis, nested away in the inlet of the Saronic Gulf, with only two narrow straits dividing it and the earth of Attica. The strait to the east of the island is 1,200 meters wide and the one to the west is only 500 meters wide. This tight embrace with the Attic mainland forms the closed gulf of Elevsina to the north of the island. Salamis, the largest island of the Argosaronic, has an area of 95 square kilometers, a coastline of 104 km., and a population of almost 30,000. The majority of the inhabitants live in the capital, the coastal town of Salamis – also known as Koulouri – whilst the remainder are scattered around the various villages. The coasts of Salamis have many gulfs and pretty capes, and settlements – mainly summer resorts – have grown up within them. 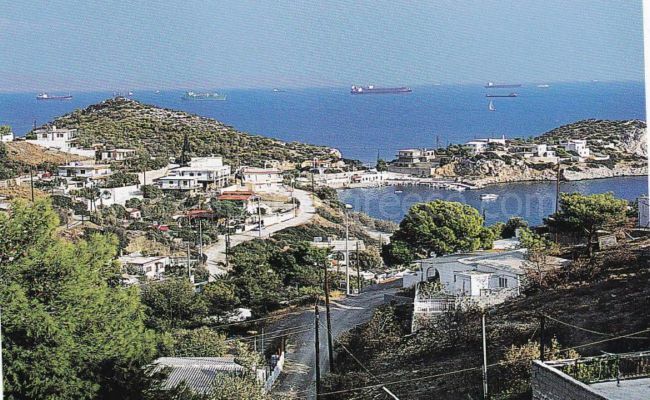 Most of the traffic from Attica passes through the port of Paloukia.